Minutes of Evidence is an innovative project that seeks to extend public and scholarly understandings of structural injustice. It is based upon the 1881 Victorian Parliamentary Inquiry into the Coranderrk Aboriginal Station, which was situated fifty kilometres northeast of Melbourne near Healesville. Associate Professor Julie Evans from Criminology in the School of Social and Political Sciences was lead chief investigator. She began developing the project in 2009 with historian and writer Dr Giordano Nanni, who came to her with the idea of converting the 1881 Inquiry into a verbatim theatre play. The team soon expanded to include interdisciplinary researchers from The University of Melbourne and from external institutions. Assoc. Professor Evans was interested in connecting the history of relations between Indigenous peoples and the state to the field of transitional justice, the justice process through which societies seek to redress human rights abuses, rebuild social trust, and enable political transition. "I thought a play would be a perfect way to facilitate the conversation that I had been thinking of," recalls Assoc. Professor Evans. "My theoretical and conceptual framework for the project came together with Giordano’s focus on verbatim theatre." Professor Emerita Patricia Grimshaw joined as a chief investigator on account of her expertise as a historian. She explains the significance of the Coranderrk Inquiry: "The testimony has a large number of Aboriginal people who are talking about justices, rights, and land in a quite remarkable way." Assoc. Professor Evans adds: "It shows a long history of Aboriginal activism as well as evidence of collaboration between Aboriginal and non-Aboriginal people." The Minutes of Evidence project has three main areas: research, education, and performance. The first two years were devoted to establishing relationships with stakeholders - Indigenous and non-Indigenous arts and community groups, educationalists, government organisations, and researchers. Seed funding from the Faculty of Arts, the City of Melbourne, La Mama Theatre, and other groups sustained the work until the receipt of an Australian Research Council Linkage Grant in 2011. While VicHealth and the Victorian Department of Education and Training (DET) are major contributors, funding and in-kind support came from a total of thirteen bodies. The research component has not only produced books and articles - it also has fostered four early-career Indigenous researchers. The education aspect has filled a gap in DET's curriculum with new units and resources for year 9-10 History and Civics and Citizenship available to teachers from 2016. Visit the Minutes of Evidence website. Dr Nanni's vision of a verbatim theatre play has been brought to life with the help of La Mama Theatre and ILBIJERRI Theatre Company. Caitlin Dullard, manager and creative producer of La Mama, explains why the theatre got involved. "La Mama has had a long history of supporting community projects and Indigenous works, so it was an amazing invitation for us. You would never say no to the opportunity to use theatre as a vehicle to tell a story like this." The theatre production, Coranderrk: We Will Show the Country, has become one of La Mama's most successful shows. Dr Nanni edited the minutes to a viable length for a stage production in collaboration with Andrea James, a Yorta Yorta playwright. It enables audiences to hear and see the story in the original words of the participants. 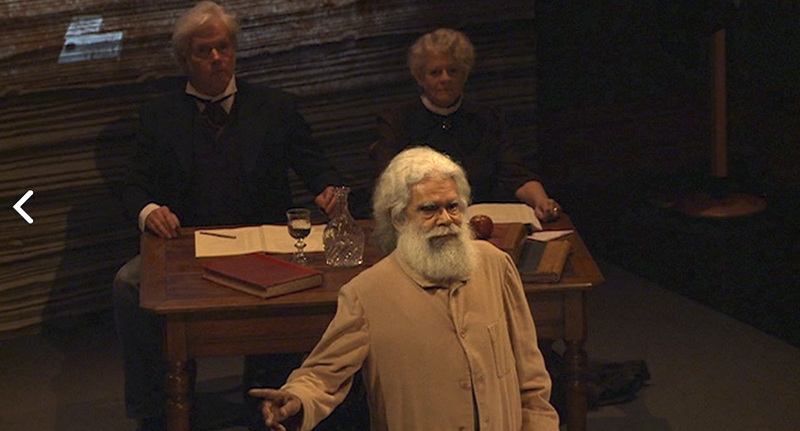 The play has run for multiple sold-out seasons on Country, in Melbourne and regional Victoria, and at the Sydney Opera House. "There is a real appetite for it," says Ms Dullard. "Your whole perception of a period of time can be completely changed in one second and affirmed in another. It's an emotional and visceral experience; you’re present in the space." The play and the education modules mean the project will remain influential. "We wanted a legacy of engagement beyond the funding period," explains Assoc. Professor Evans. "A key legacy is the curriculum development, and the same for the performance - it is now viable and successful." Professor Grimshaw gives particular praise to the collaborative engagement. "There are ways Aboriginal history can be done better, with collaboration, and once you’ve experienced it through a project like this you'd regret to see it regress." For more information about the Minutes of Evidence project, email info@minutesofevidence.com.au.